When I was a kid in the ‘70s I first became aware of writer/director John Milius when I read that he was the inspiration for the character of John Milner, the drag racing greaser played by Paul Le Mat, in George Lucas’ 1973 classic AMERICAN GRAFFITI. The fact that that piece of trivia isn’t even mentioned in Joey Figueroa and Zak Knutson’s 2013 biodoc MILIUS, currently streaming on Netflix Instant, just attests to what a richly layered life the mythical maverick filmmaker has led. It all began in the ‘60s shortly after Milius was crushed by being rejected by the Marine Corps because of his asthma (“I missed, you know, going to my war”), he wandered into a theater showing a week of the films of Akira Kurosawa. The Japanese filmmaker’s work made Milius realize that being a director was the “next best thing” to a military career. Then he was off to USC (University of Southern California) where his classmates included George Lucas, Caleb Deschanel (father of Zoey Deschanel), Donald F. Glut, and Randall Kleiser (GREASE) - most of whom appear to provide interview soundbites throughout the film. 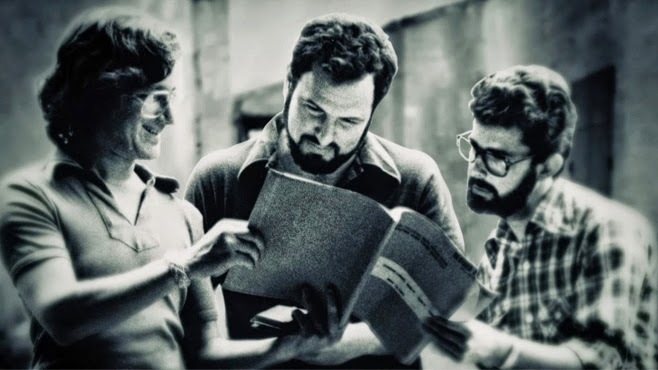 Milius was the first of these film-minded folk to achieve success when he was hired by AIP (American International Pictures), a studio that specialized in cheapie “teensploitation” productions. His first screenplay credit was on a rip-off of THE DIRTY DOZEN called THE DEVIL'S 8 (“they didn’t have enough money for a full dozen”). Following that, Milius worked on the scripts of EVIL KNIEVEL (1971), DIRTY HARRY (1971), JEREMIAH JOHNSON (1972), THE LIFE AND TIMES OF JUDGE ROY BEAN (1972), and his feature length directorial debut DILLINGER (1973). Milius’ second movie, the 1975 adventure epic THE WIND AND THE LION, starring Sean Connery and Candice Bergen, garnered a few Academy Award nominations, but his third film, the 1978 coming-of-age surfing picture, BIG WEDNESDAY, flopped big-time (of course, it became a cult classic later). Much more notable during that time were his iconic contributions to Steven Spielberg’s 1975 shark attack classic JAWS (Robert Shaw’s USS Indianapolis monologue), and Coppola’s massive 1979 mash-up of Joseph Conrad’s “Heart of Darkness” and the Vietnam war, APOCALYPSE NOW. Can you get any more quotable than “I love the smell of Napalm in the morning,” or “Charlie don’t Surf”? I don’t think so. “Everything memorable in APOCALYPSE NOW was invented by John Milius,” Coppola stresses. Milius’ fourth film as director, the 1982 Arnold Schwarzenegger fantasy epic CONAN THE BARBARIAN (co-written by Oliver Stone) was a hit, but it was with his next film that things got pretty hairy. 1984’s RED DAWN, about a Russian invasion on American soil, polarized critics and got Milius ostracized from Hollywood for its pro-war stance. “Right-wing jingoism,” more than one critic called it. There’s no getting around that the big beefy bearded gun nut - there are more photos here of Milius with machine guns, rifles, whatever firearm than you can count - rubbed a lot of people wrong. His following projects, FAREWELL TO THE KING, FLIGHT OF THE INTRUDER, and the TV movie ROUGH RIDERS, were barely blips on the pop culture radar. This obviously explains why there’s so much footage of Milius doing interviews from the ‘80s and ‘90s – a 1984 sit down is the most prominently featured. MILIUS left me feeling like every larger than life tough guy character of the modern film era was based on his powerful persona. Especially when his son Ethan and daughter Amanda talk about how much John Goodman’s Walter Sobchak in THE BIG LEBOWSKI reminded them of their father. 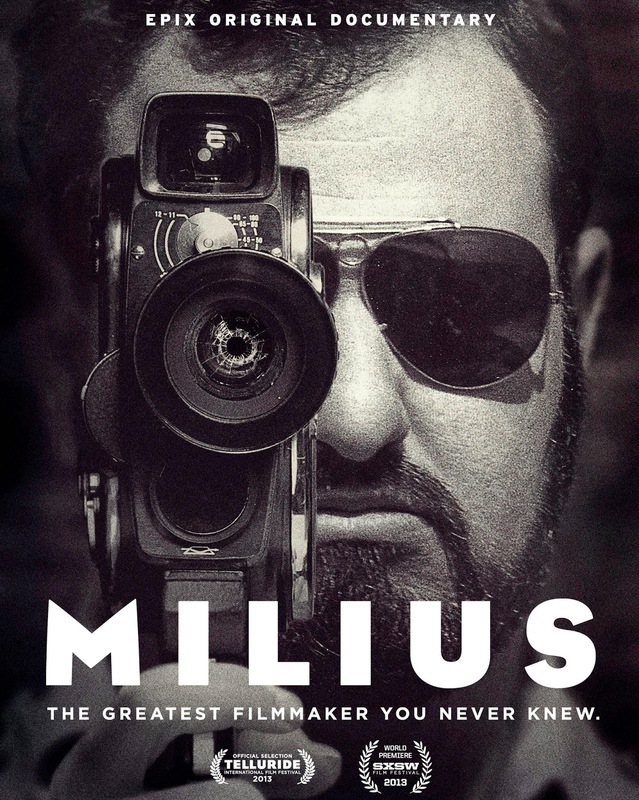 MILIUS is for the most part a fascinating and thoughtful look at the life of a macho force that can still be felt in the fantasy realm from Game of Thrones to THOR, and the amped-up egos of the overblown action movie genre. As his encouraging rehabilitation continues, I sure hope the man can finish his long gestating GENGHIS KHAN project. That would give his legend the satisfying epilogue that this biodoc only hints at.